My wee little Jinky bean and his wife had their own little bean last Monday, March 11. James Warner Evans V. Long story short: emergency c-section, brain injury from lack of oxygen, cooling therapy for 72 hours. A lot to deal with for a wee little baby. Actually he wasn't that wee at 7 lbs 14 oz. He has been in NICU since minutes after birth and he's the biggest one in there. Little Jimmy (LJ) is a darling! 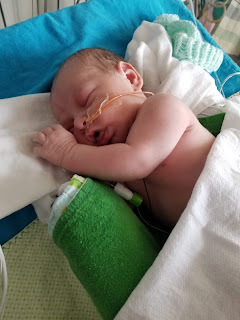 Jim and I planned to go out to Spokane to visit so we had our plane tickets already, but we didn't count on spending most of the visit at the hospital, but we do what we gotta do to let that little bean get the best start possible.